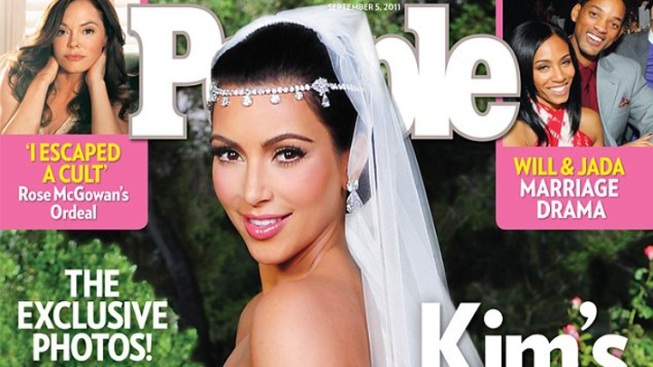 People magazine's cover story exclusive on the wedding of Kim Kardashian and New Jersey Nets player Kris Humphries has proven a hit both online and on the newsstands, WWD reports. Having paid the couple a reported $1.5 million for the scoop, the magazine is making that total back and more with projected newsstand sales to rival the magnitude of more than six million page views to people.com. The print edition offers the first full view of all three of Kardashian's custom-designed Vera Wang gowns, as well as the bridal party's all-ivory dresses, also designed by Wang. Guests adhered to a black-and-white color palette, and VIPs like Avril Lavigne and Lindsay Lohan -- wearing a white version of Pippa Middleton's royal wedding reception Temperley frock -- are pictured in the party pages as well.